​Click here to download Parent Brochures. When a report of child physical abuse, sexual abuse or sexual assault is reported to Law Enforcement or the Department of Social Services, a forensic interview with the child is scheduled at Foothills Child Advocacy Center. The child is interviewed at Foothills by a professional who is specially trained in child forensic interviewing. The non-offending caretakers receive crisis intervention and referrals for ongoing services that support the child or family. This process is based on a national Child Advocacy Center model that seeks to reduce trauma to a child caused by multiple, duplicative interviews. The national CAC model holds more offenders accountable through improved investigation and prosecution, and the multidisciplinary team approach allows for more children and their non-offending caretakers to receive services. 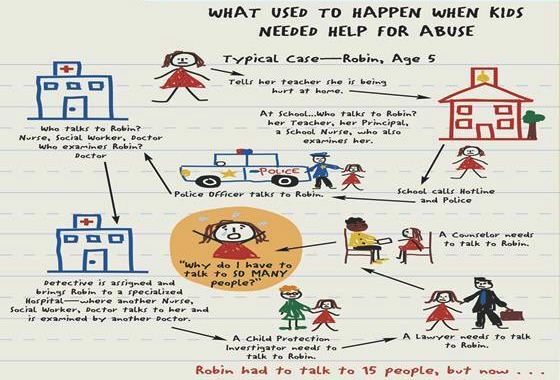 If a child discloses abuse to you, or if you suspect or have reason to believe a child is being abused or victimized, contact the police or social services. The number for the Child Abuse Hotline is 800-552-7096. Local police can be reached by dialing 911. A forensic interview with the alleged child victim is the first step in a child maltreatment investigation. A forensic interview is a process where a child is given the opportunity to make a statement about what happened in a safe, supportive environment. The child is questioned in a legally-sound, developmentally appropriate manner by a trained professional. Members of the multi-disciplinary team that have jurisdiction over the case observe the interview as it is taking place. Interviews are digitally recorded, reducing the number of times children need to be interviewed, therefore reducing trauma to the child. Information gathered in the forensic interview is used to help make decisions about protection, prosecution and treatment. Foothills CAC provides forensic interviews for the following areas: Charlottesville and the counties of Albemarle, Buckingham, Fluvanna, Greene, Louisa, Madison, Nelson, and Orange. Foothills works to prevent further victimization of children by educating parents and organizations about child abuse. Foothills provides education about the advocacy center and the multidisciplinary team model to the community and sponsors Stewards of Children, a program which provides adults the knowledge of how to prevent, recognize and react responsibly to child sexual abuse. Foothills Child Advocacy Center is proud to work with a team of professionals in Charlottesville and Albemarle County dedicated to the investigation and prosecution of perpetrators and to the support and treatment of child victims and their non-offending caretakers. The multidisciplinary team meets monthly to communicate and collaborate on child maltreatment cases. Cases are reviewed beginning with the victim’s initial outcry through investigation, treatment and prosecution. Communication within the team reduces duplication and keeps victims from falling through the cracks. 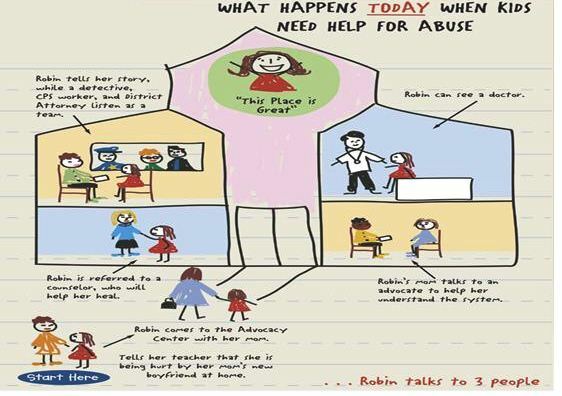 If a child discloses abuse to you, or if you suspect or have reason to believe a child is being abused or victimized, contact the police or social services. The number for the Child Abuse Hotline is 800-552-7096. Local police can be reached by dialing 911.